October 2009 – MONDO LUCHA! Posted in *Cool MONDO LUCHA! stuff*, images, Press. A stalwart mat technician in the world of professional wrestling, Derek St. Holmes, Esquire is also the color commentator for MONDO LUCHA! In the ring, or behind the microphone, this aristocrat of the wrestling mat brings a quick wit and insight to every MONDO LUCHA! broadcast. Posted in LUCHA LIBRE WRESTLING, Luchador Profiles, Performers. Some Holiday Specials would feature the Three Wisemen or a Baby Jesus. 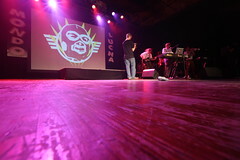 MONDO LUCHA’s HOLIDAY SPECIAL involves two, breakdancing, masked wrestlers, from Ancient Egypt. Our holiday gift to you…..THE OSIRIAN PORTAL. Amasis and Ophidian Can’t wait to meet Milwaukee on NOV. 27th! Posted in LUCHA LIBRE WRESTLING, Luchador Profiles, Performers, Video.